One of the items salvaged from the old Cathedral is a marble mensa, which covers the top of the top-front of the altar. This mensa was placed in the old Cathedral in 1626, and it was consecrated by Bishop Cagliares. Though similarly to the Cathedral itself, the mensa is dedicated to St. Paul, it is also dedicated to the Almighty God, and the Blessed Virgin Mary. Several relics were placed in the altar; these include a tooth of St. Recessi, as well as a finger of St. Hermes. Upon the construction of the new Cathedral, the altar was moved to its rightful spot within the building. According to a certain legend, not only is the Father of Publius buried beneath the high altar, but the marble slab on the mensa was the upper part of his tomb. Working on the measurements of Raimondo Bianchi and the design of Carlo Gimach, Francesco Arnellini created a new ornament to replace the wooden ornament found at the back of the marble. The expenses of the mensa were covered by Canon Francesco Mangion, who paid Sienese marble-workers who were in Malta on other business. In 1873, Luca Moglia created the two mosaic medallions depicting St. Peter and St. Paul which are found in the chancel itself. A Sicilian by the name of Giuseppe Valenti created two marble lecterns depicting St. John and St. Luke, which are found in front of the high altar. 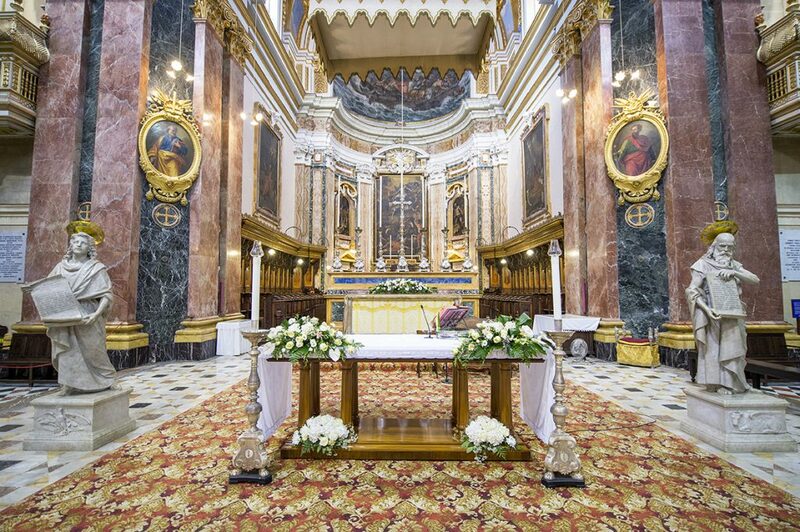 The marble floor beneath the chancel was paid for by Bishop Gaetano Pace Forno (1858-1874), the Coat of Arms of whom is found on the marble itself. The classical throne of the Archbishop of the diocese is situated to the right hand side of the chancel. This throne replaced the seat of honour reserved for the Head of State when Malta became an independent republic.